Hello one and all! 😀 Welcome to my home! For those of you who may be new to my blog, my name is Rachel and I have been blogging for about 4 years about everything from furniture makeovers and builds, to DIY projects, design, and crafts. I’m passionate about sharing ideas and projects that will help you achieve a unique, ‘collected’ look that you love, in your home. I live in the suburbs of St Louis with my husband and 3 kiddos and when not building or blogging, I LOVE to watch my boys play soccer. HomeGoods sponsored this tour, which was SO fun because hello– I shop there all the time anyways! 🙂 I also spoke with my friends at Country Living Magazine and they agreed to co-host this hop! Make sure and check out the article they wrote about our Spring Home Tours HERE. OK, so here’s the dealio. I KNOW a vast majority of ya’ll out there don’t go ALL OUT like I did and redecorate/style/refresh most of the rooms in your home for Spring. I get that this is NOT NORMAL. Bloggers are not normal hahaha! 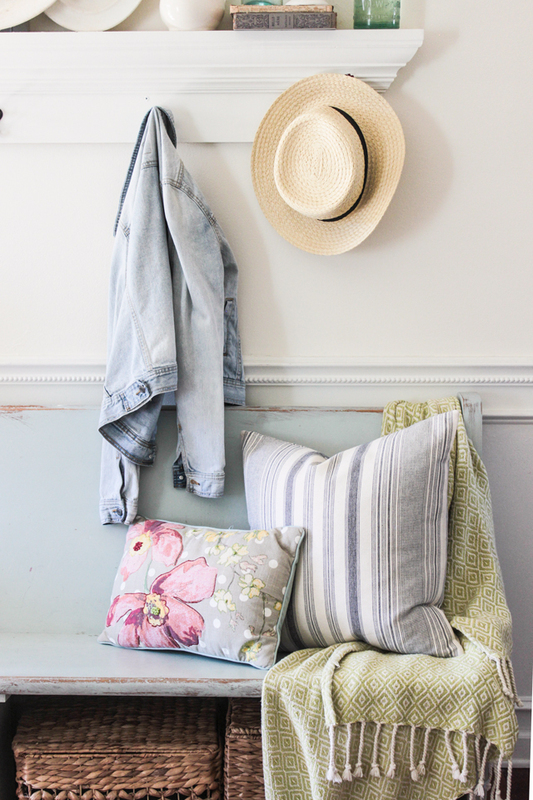 Honestly, I think some of the best things you can do to ‘decorate’ for Spring is to do a good deep clean, get rid of some extra stuff, and then add a new pillow or throw to make it feel fresh. Some flowers here and there don’t hurt either, but that isn’t always realistic to maintain all season long. Lastly– my home doesn’t stay like this– we live in it. 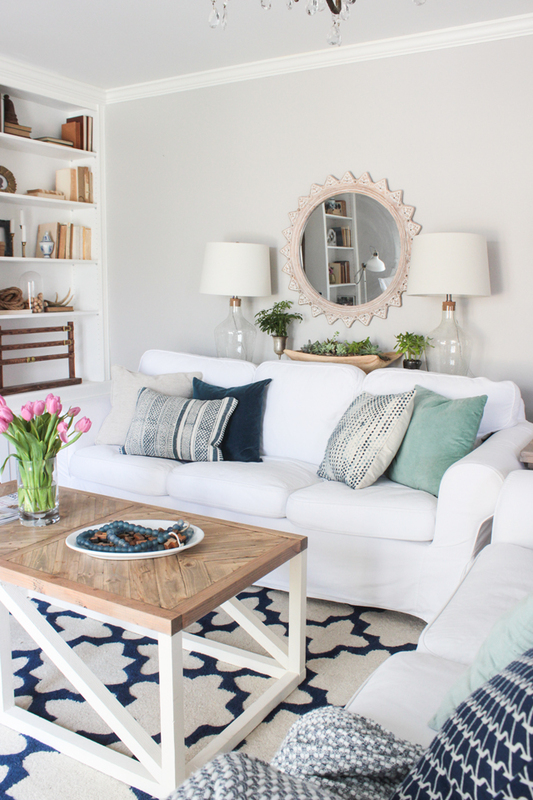 Yes, I like to keep it tidy because I work from home and I feel happier and more productive when things are tidy, but right now not a single room in my home looks as good as it does in these pictures. Comparison is the thief of joy! Just gather some inspiration from all these tours today and find 1 or 2 things that you really liked and think you could copy, and do it! THAT is what I would love for you all to get out of these tours. Welcome to my entry! This little church pew is probably my favorite thing to style. It’s also challenging not to repeat things I have done in the past! This one in particular has a fun ‘vintage collections’ vibe. Almost everything here was what I already owned– except that gorgeous striped blue pillow from HomeGoods. 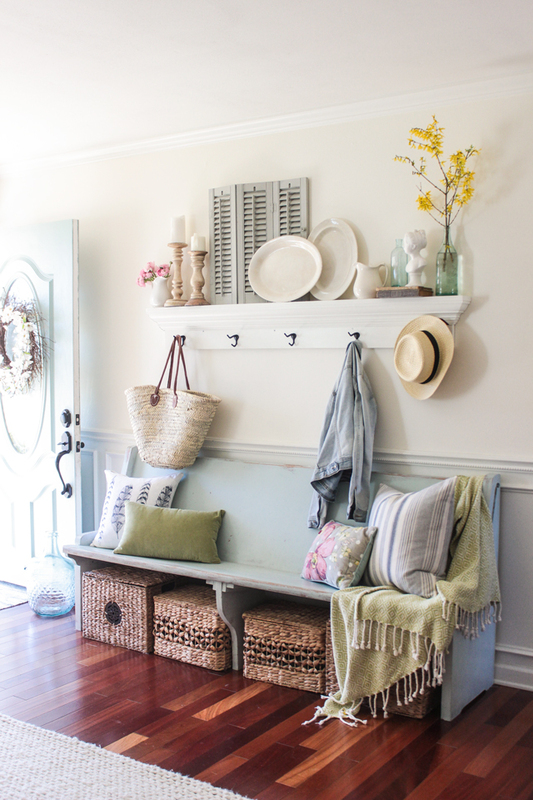 The bench is vintage, but the shelf with hooks tutorial is found here. 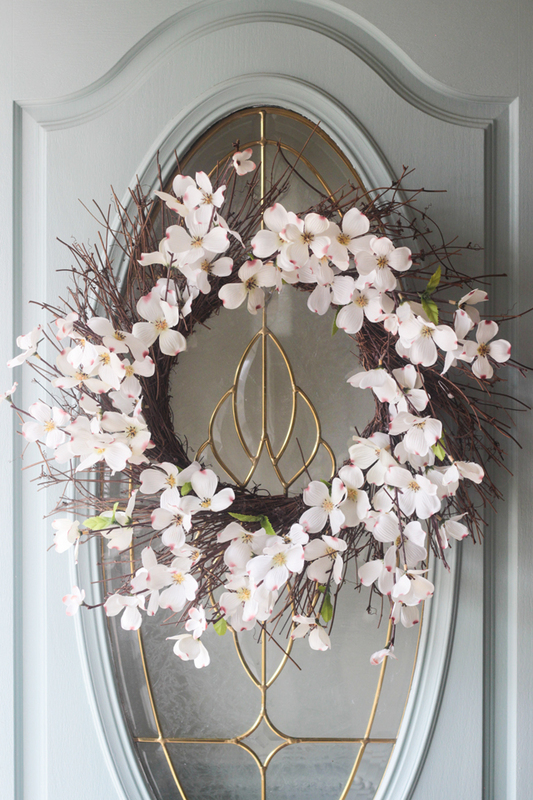 I also picked up this pretty wreath at HomeGoods. It’s the most cheerful thing when I see it as I pull in our driveway! This buffet I built last November got a little refresh since I moved over the lamps that used to be on the piano and added some greens, art and books. You know what helps me when I’m struggling to style a spot like this? 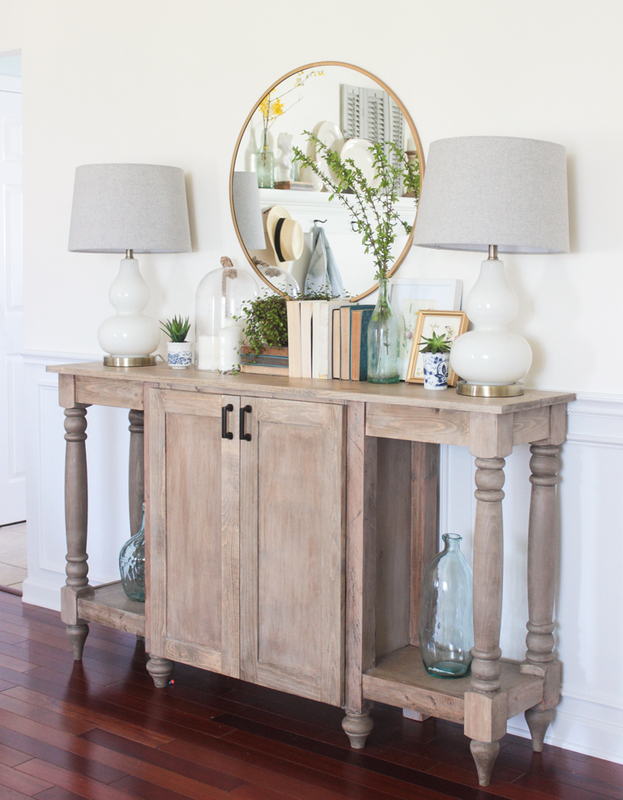 I get on Pinterest and search “console table styling” and see what my blogger friends have pinned. From there I get a few ideas, combine them and start playing around until it feels right. I love this little spot now! I’m completely obsessed with my front siting room lately. I can’t get enough of this view! 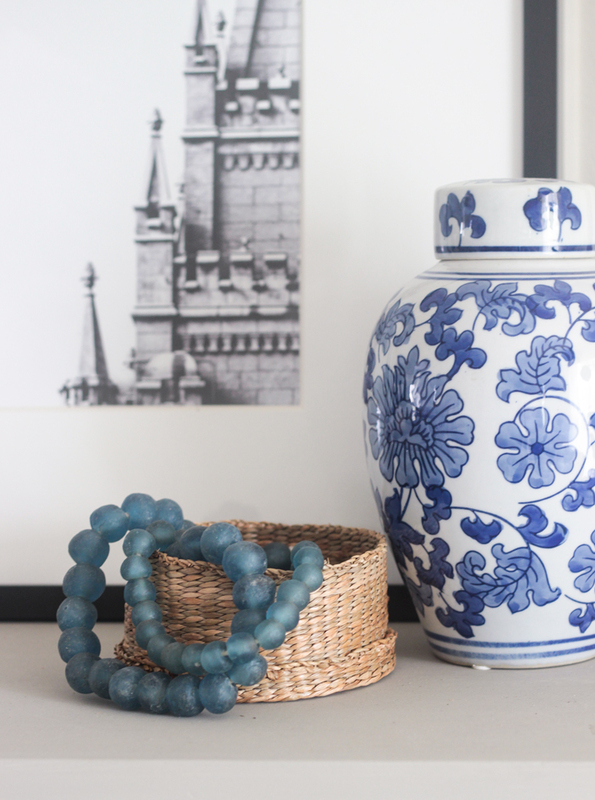 The frames, lamp, and chinoiserie vase are all from HomeGoods. You see that middle frame with gold edge? It came with a pattern paper… and while I liked the idea of the pattern art, I didn’t like the colors. So I set out to make my own! It turned out so cute I thought I’d share with you how I did it! 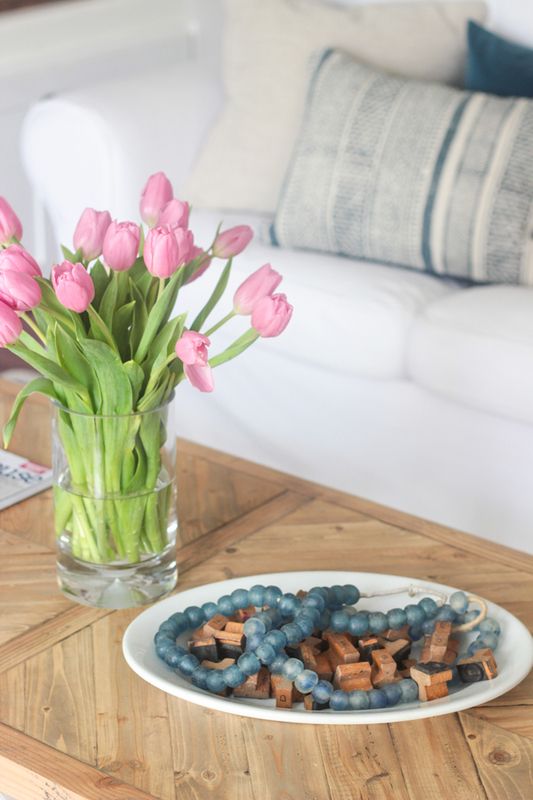 I love how tulips can brighten up a room! They grow so fast indoors though, so if I were you, I’d invest in some realistic-looking faux ones. I’ve seen them at Michael’s, I believe. I mean… what’s not to love about this view? 😉 Slightly biased over here. The fiddle leaf fig is new! I got it at my floral wholesaler a couple weeks ago and I haven’t watered it once and it has already sprouted a new leaf! Tufted chair was from HomeGoods last year, piano is vintage that I painted gray, the sofa is from Joss & Main, and the braided wool rug is from RugsUSA. Here is the kitchen looking all bright and clean! The island is another build of mine, and this kitchen (if you are new here) was all DIYed, so I have tutorials for pretty much every part of it. That baking accessories on my counters are all from HomeGoods, except for the white ceramic measuring cups— they are from World Market. I cheated 100% on this dessert. 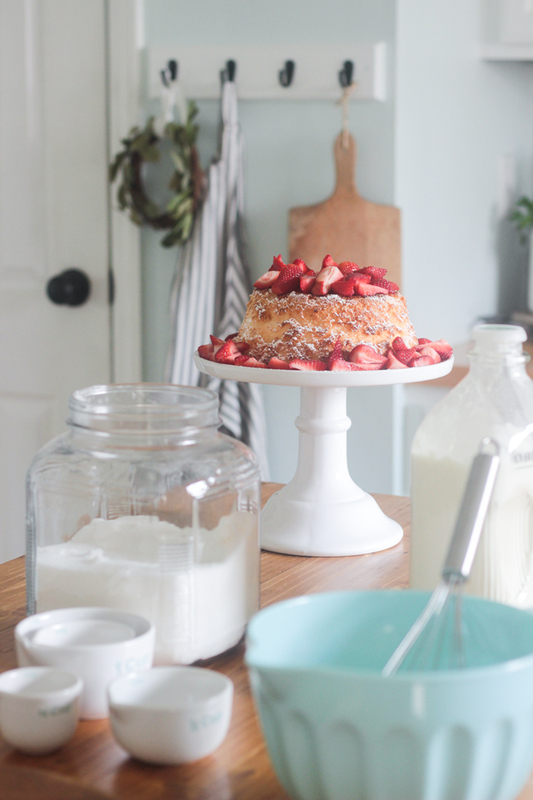 I bought an angel food cake, dusted it with powdered sugar and put some fresh strawberries on top. And I’m not sorry! I did whip up some fresh cream, however. That stuff is goooooood. You remember that french basket in my entry? This is the little sister of that basket– this is the perfect size to hold fruits or veggies and I got both at a little shop in St Charles called Red Door Furniture Co.
Ooooh Oooh! I added something new here in the kitchen! I got a runner from Dash & Albert! This was something that was brought in for the photoshoot a few weeks ago actually. It was a little long but I cut it to size and sewed up the end. It is absolutely perfect and it’s an indoor/outdoor runner so it cleans up ridiculously amazingly well. I also got this rug also from Dash & Albert, for under my dining table. It’s indoor/outdoor rug and I kid you not, everything comes out of it with just water– even smushed raspberries. This one is the C3 Herringbone one in Linen. 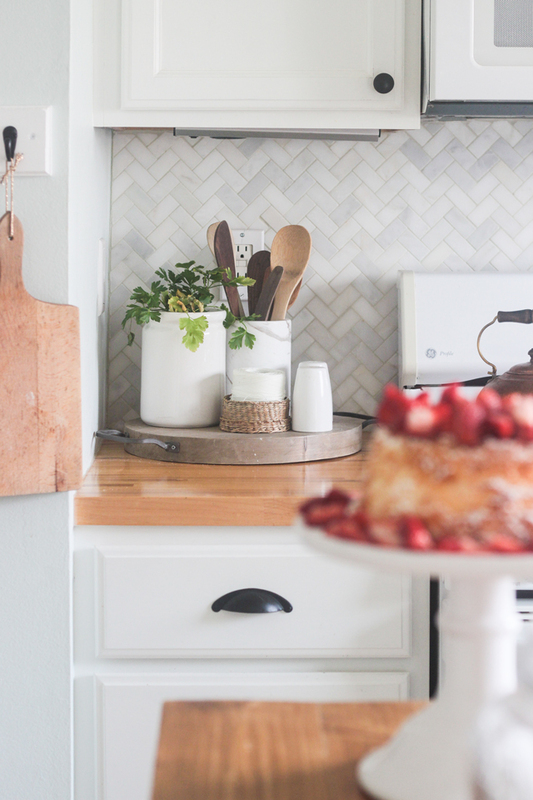 When I set up my kitchen and dining table, I imagined I was inviting my girlfriends over for dessert and to chat. 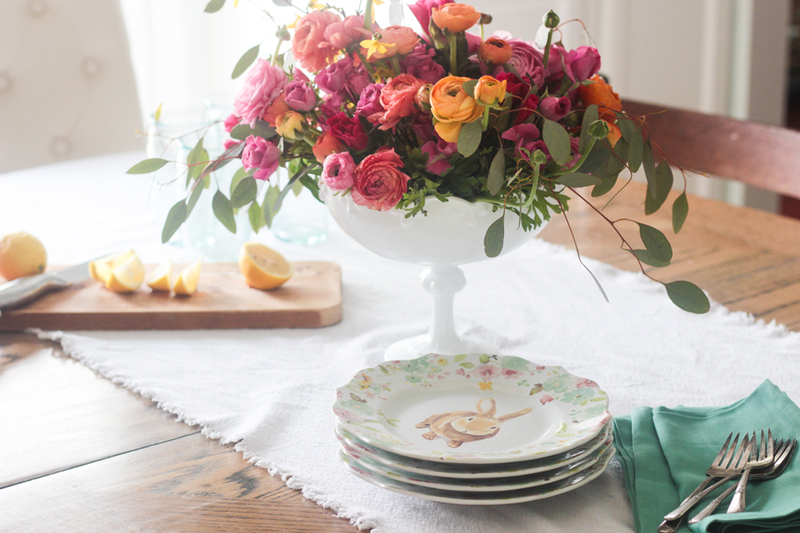 So I set out these sweet bunny floral plates from HomeGoods, and set things up like I would be serving cake and lemonade. Perfect for Spring, right? 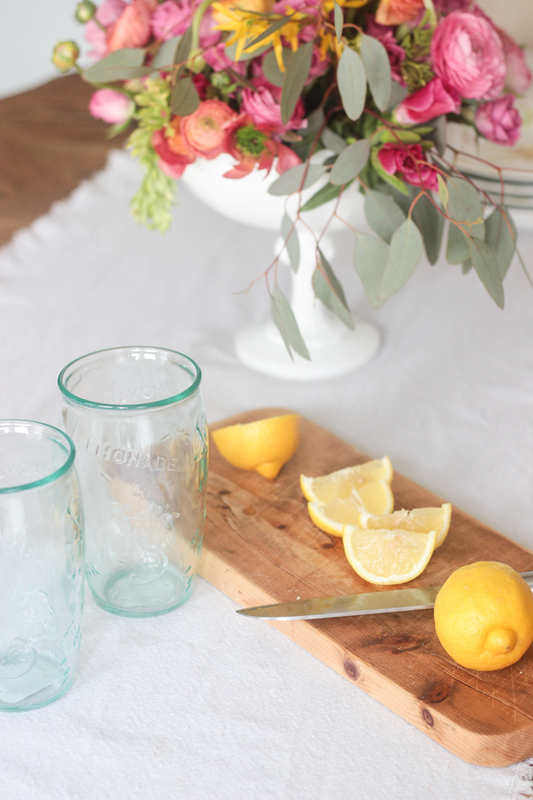 Those lemonade glasses are also from HomeGoods. I bought the last 4 my location had! That secretary makeover is found here. For this room I re-pulled-out all my teal, navy, and aqua, pillows, added in a few more pillows from HomeGoods (surprise surprise! ), and some throws. I’m so very tempted to either find another wing chair to slipcover and sit next to this window (so there would be a pair of chairs), or buy two new wing/arm chairs to sit over here. Because I’m growing tired of the L-postion of these couches. Should I shrug the feeling? How do we feel about the L-position? Noticed I swapped out the lamps? This are a pretty change from the black ones that were there for nearly 3 years. I am low key obsessed with these glass beads. My friend, Charlotte, got them for me at a flea market by her house because there is nothing like them here locally! Another switcheroo I did was the artwork in the two darker frames. I got these as digital downloads from a couple of Etsy sellers. They are so so good. I’m crazy about the water one in particular. I got tired of trying to put frames up on every blank wall space, and decided this wall needed texture. 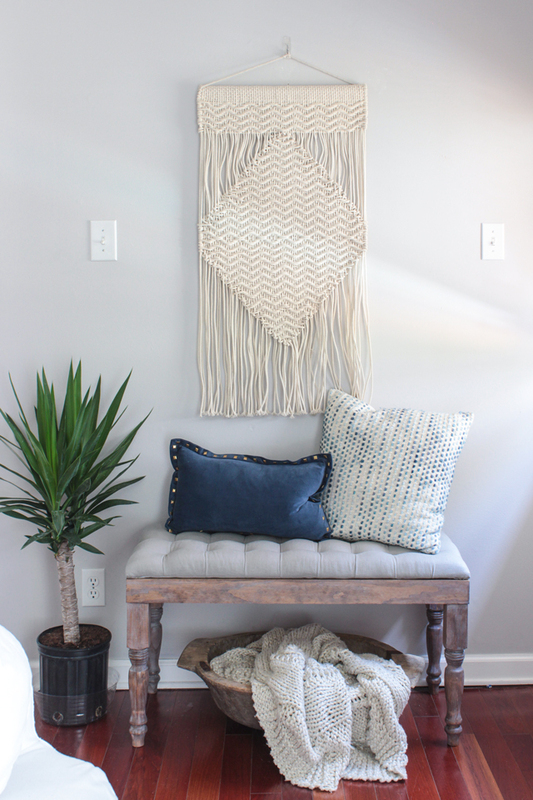 Macramé wall hanging for the win. In this room, I have tutorials for wood pallet accent, the cabinet bases of the bookcases, making the bookcases into built-ins, the storage bench, the coffee table, the slipcovered chair, the round trestle table, and even though you can’t see it pictured here, the farmhouse end table between the two sofas. I also wrote about why we chose white slipcovers when we have young kids and how we keep them clean. I would love if you went and visiting all these other amazing friends of mine and their beautiful homes! And tell me what was your favorite part! 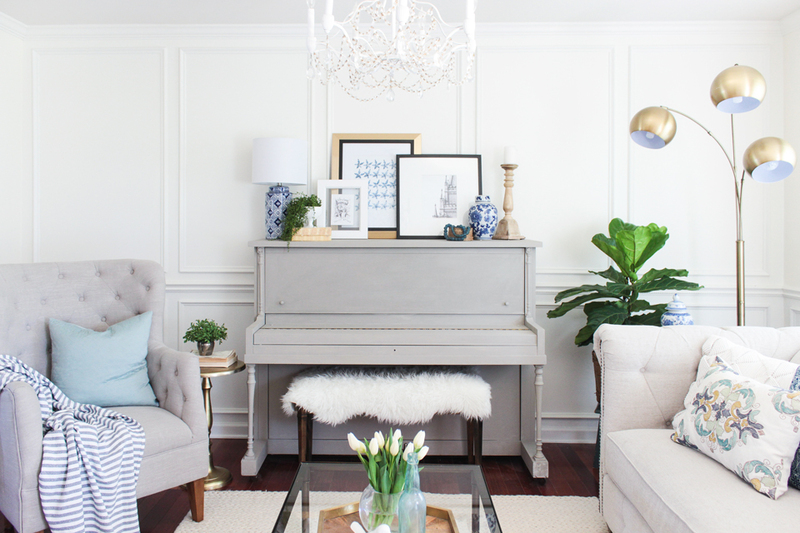 the piano area is my favorite- love the blues and greens!congrats on all the exciting things happening for you! 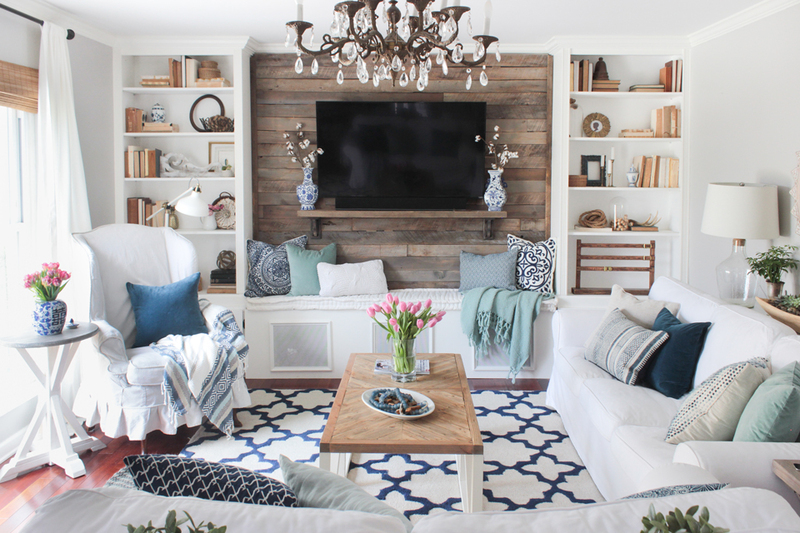 I love the blue and white rug in your living room…any chance you can share where you got it? The house looks beautiful! Thanks for sharing! Sorry– yes! It is the Tuscan Terali Trellis Rug in Ivory from RugsUSA! 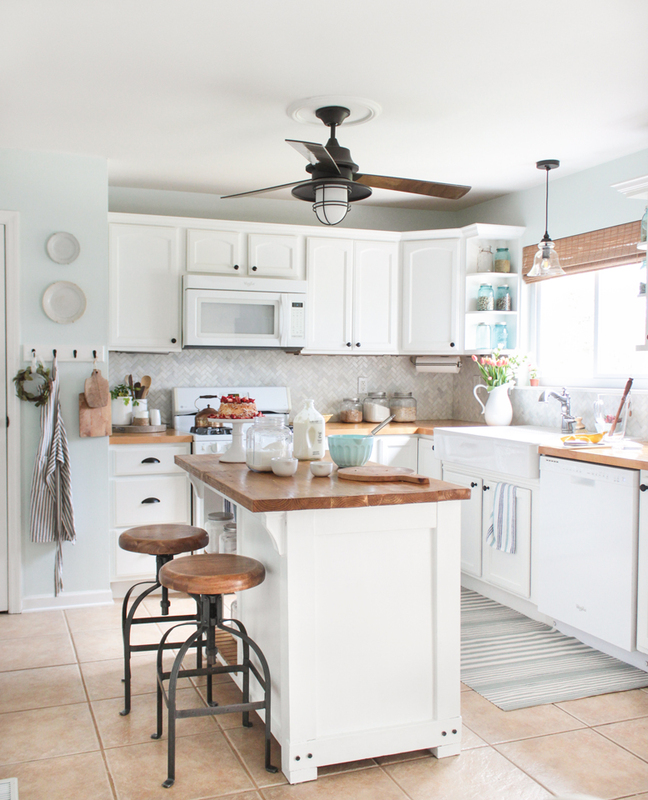 I just had to comment to tell you how Inspired I was by your Home Tour! I am snowed in today & you motivated me to deep clean & redecorate. Thanks for sharing your beautiful home!! You have a very beautiful home! It is so welcoming and I just love how comfortable it seems. I was wondering if I can pin the pictures from this blog post. 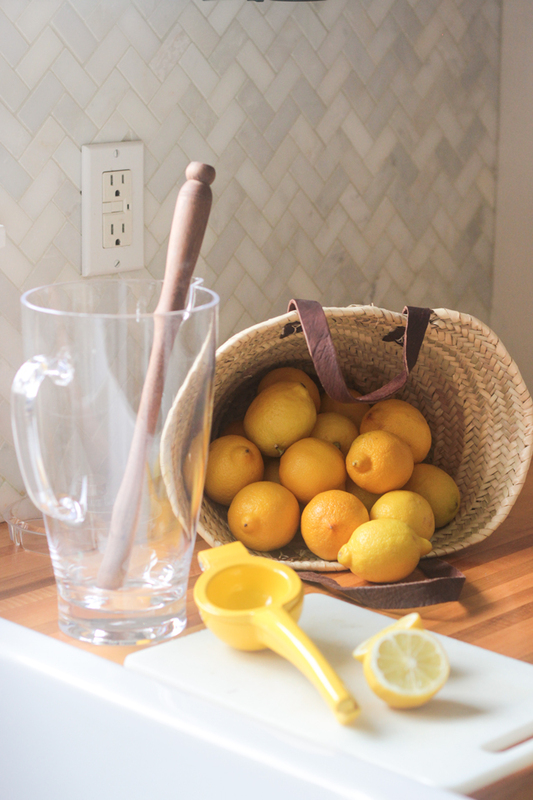 I especially love the pictures of your kitchen. I am always looking for inspiration and your home is just what I would love to do in my own home one day. Absolutely! I should have a pin it button at the bottom of the post so you can select which images you want to pin. Let me know if you don’t see it or it doesn’t work. Rachel everything looks so beautiful! Thank you so much for all your hard work putting this amazing Spring Home tour together. It’s so beautiful, Rachel! I love how fresh and clean it feels! Thanks for including me. Your home is so beautiful Rachel!! Trying not to be envious over here – I would move into your house in a heartbeat. Gorgeous! I have to ask, where did you get your wood horse that is on your sofa table? So beautiful! I love the pops of blue throughout! Hurry up spring, we miss you! So incredibly beautiful! I love it all. And I love that you have a DIY tutorial for every large structural item in your home. You are truly amazing Rachel and your talent astounds me! 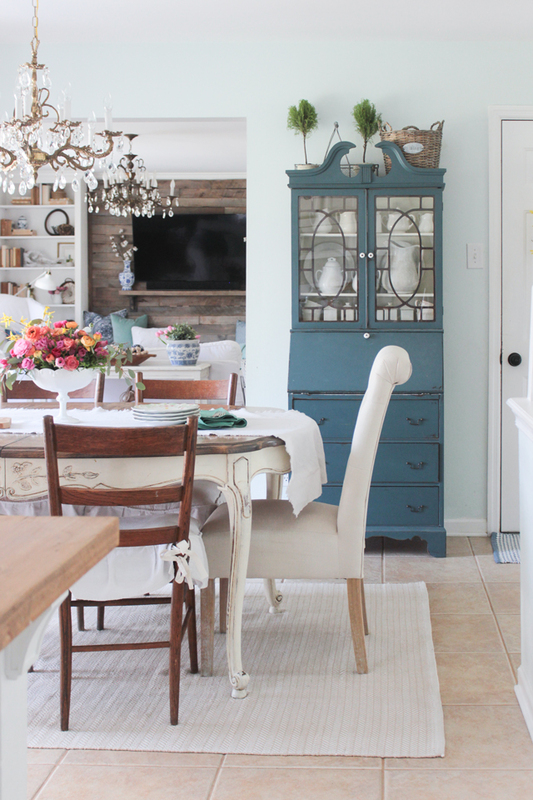 Thanks for including me in the Cozy Home Spring Tour! xoxo! p.s. “Bloggers are not normal.” I think I need this on a shirt! LOVE IT ALL! Totally lol’ed at the “bloggers are not normal” comment – so true! Your home looks amazing, Rachel. 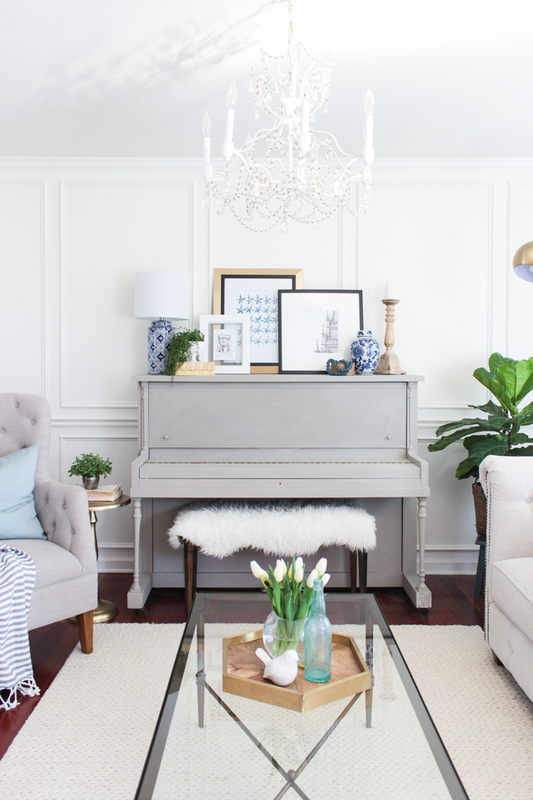 The piano with all the pretty blue and white is gorgeous. 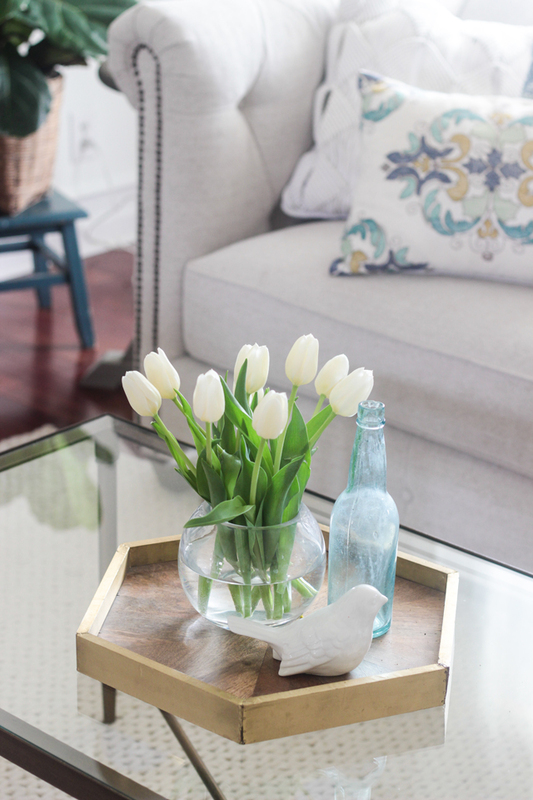 I still swoon when I see your DIY coffee table and I’m reminded that I need to make one! Thanks so much for organizing this tour for us. It’s been a blast! Wow ! I love it all ! You never disappoint! Your home is so pretty and cozy. All of the Navy and pink accents are perfect for spring. 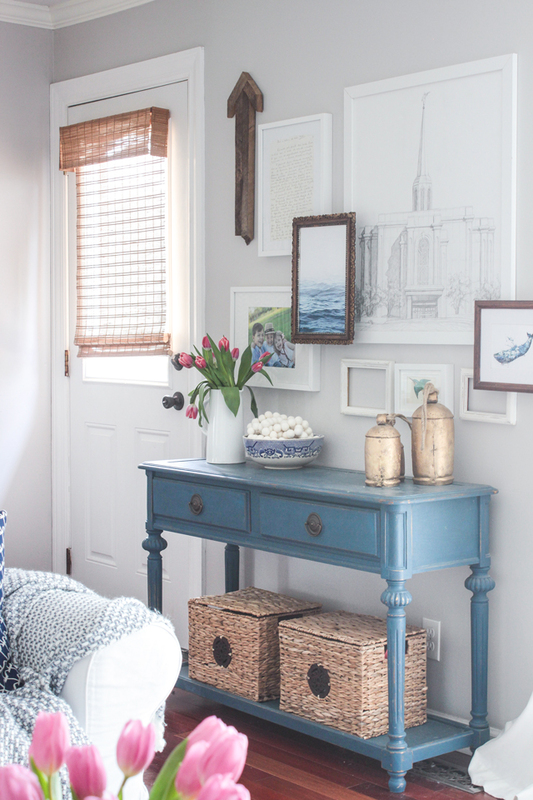 I love that blue console table. Thanks for sharing so many great ideas for spring. Love it all and your piano room is my fav. 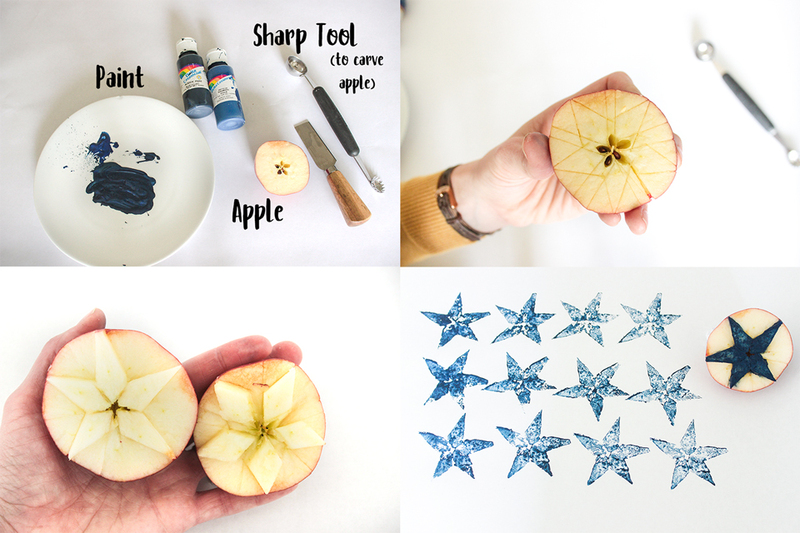 That apple tutorial is the cutest. Always look forward to your home tours. Just gorgeous! Love all the details. I brought those same baskets from France, a few big ones and little ones. I can’t get enough of them! 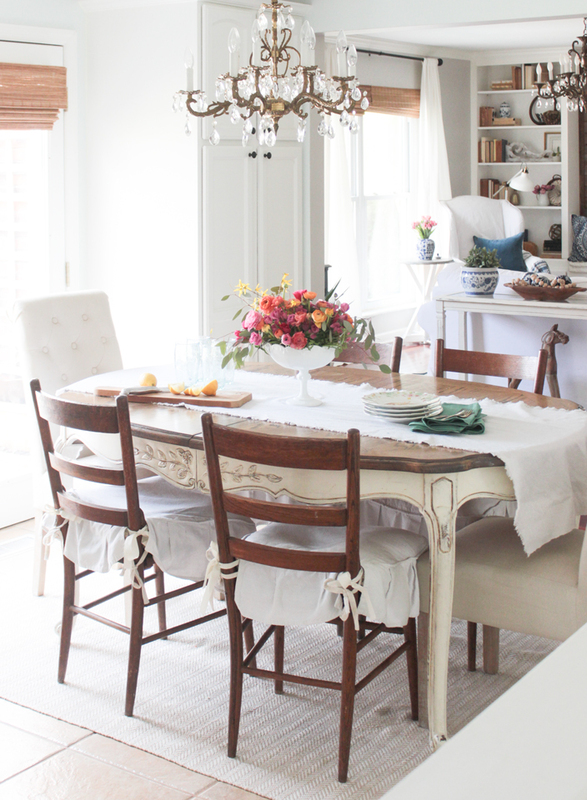 I love this spring tour and your home is gorgeous, Rachel. Thanks so much for inviting me to tour with you! I think your home is prettier each time I see it. Love all the details and love you put into each room. Thanks for organizing the tour, Rachel! 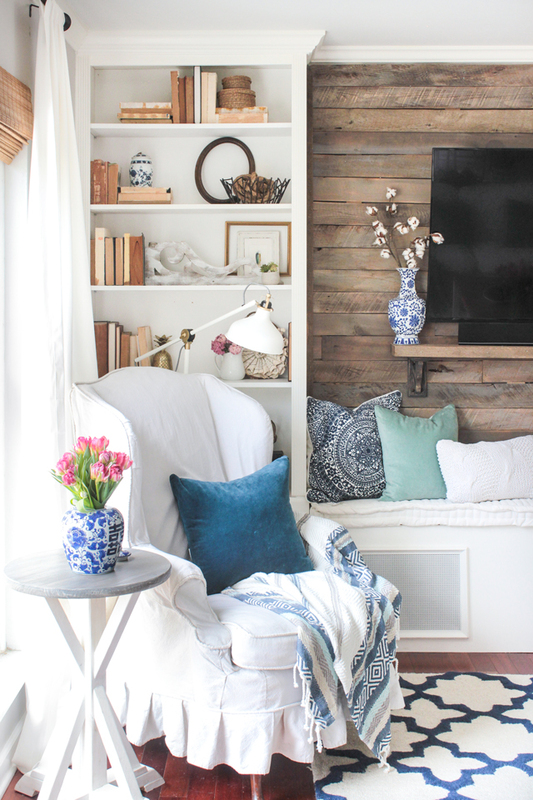 I’m in love with the two patterned pillows on your reclaimed wood wall. Where did they come from? Also I’m totally in favour of you changing up your living room furniture arrangement. L-shaped is great but I love to see the pros change things up so I can get ideas. How about the two sofas facing each other and then work in the chairs? I’m originally a Lettered Cottage follower -still am, I adore Layla & Kevin- but I’ve added you into my favourites. I may also have to start checking out MakingHomeBase. I like what she did. I like the practical approach to styling one’s home. 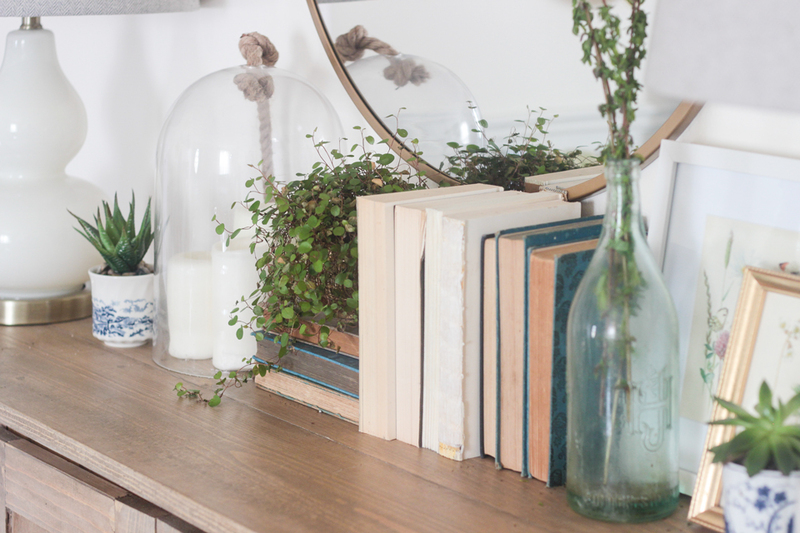 I love those that “shop the house” / upcycle, and decorate on a budget. Thanks for this home tour. Love it all! So fresh and inviting. 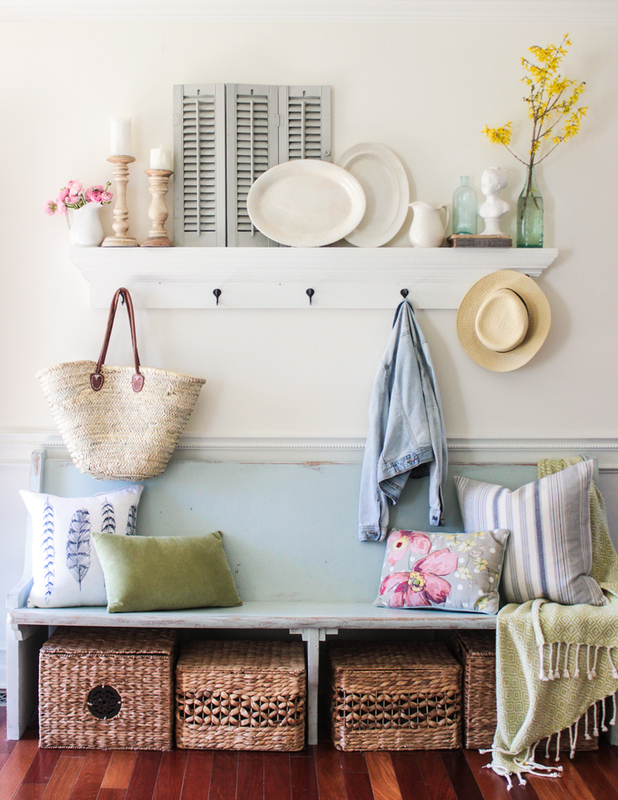 Can you share a source for the straw tote hanging on the entry shelf? Thank you for inviting your readers into your lovely home. I just love your spring tour! There is a little something for every style. 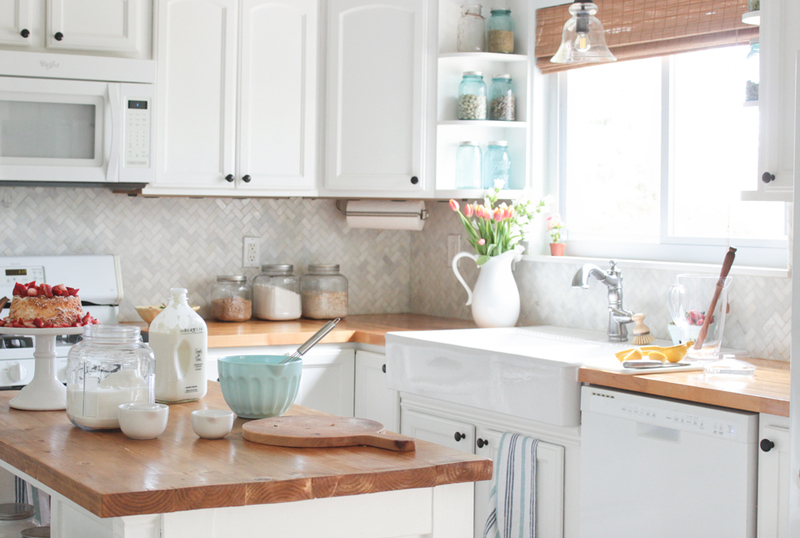 I’m smitten over the dining space and your backsplash! I love your style, but I especially LOVE the chair rail in your entry. PLEASE tell me where you purchased it! 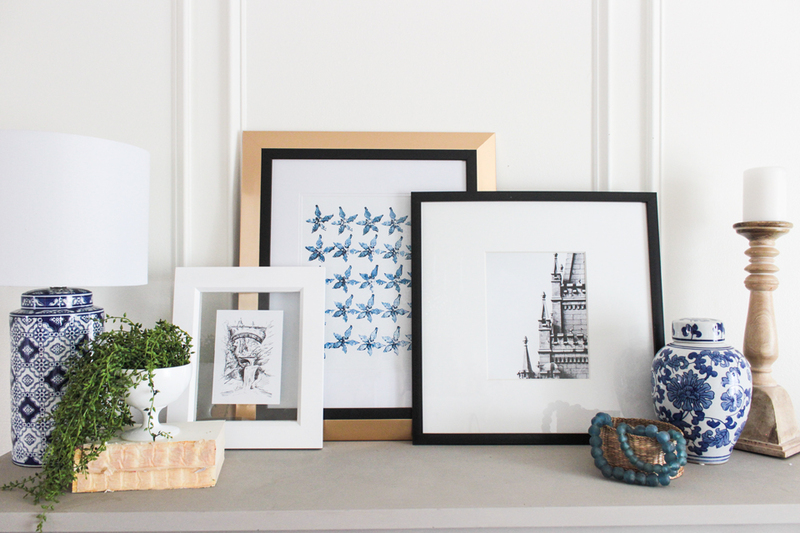 I love your home – we re kindred spirits re decorating, sharing, teaching and changing up what you have and HomeGoods! My top favorite store-I say I put them on the map when they opened in our town. I lived in there and could stage and decorate an entire home in 75% HomeGood items. I’m so happy to see them supporting creators and bloggers! Makes my heart sing! Kudos to you for making it happen and inspiring so many. Re L shaped sofas – I think you are stuck with that footprint due to the television-ignoring the tv, as you know, place the sofas opposite and have two chairs facing the tv. That would give it a more open feeling as you look into the room. But who cares – it’s great the way it is. It would be fun to have a large, square ottoman to replace the coffee table and put your feet up. I painted my Mom’s antique corner hutch Annie Sloan Greek Blue with dark wax – very similar to your pieces – love it! I just found you and adore you. Thanks for all you do. Oh, I’ve been buying the recycled glass beads (or sea glass beads) for jewelry making for many years (now everyone is loving them) at Happy Mango Beads! Go get some! I can’t find your recipe for stain removal that was mentioned on your Instagram photo today. Would love to try it! Enjoy your posts on Instagram so much! And it’s under #3– I swear by that Clorox Stain Remover– I will even just put that with some water in a spray bottle and spray all the stains down an hour or two before I throw them in the wash with the oxy-clean white powder stuff. Your blog is great! I just read a different post of yours and followed a link to this. 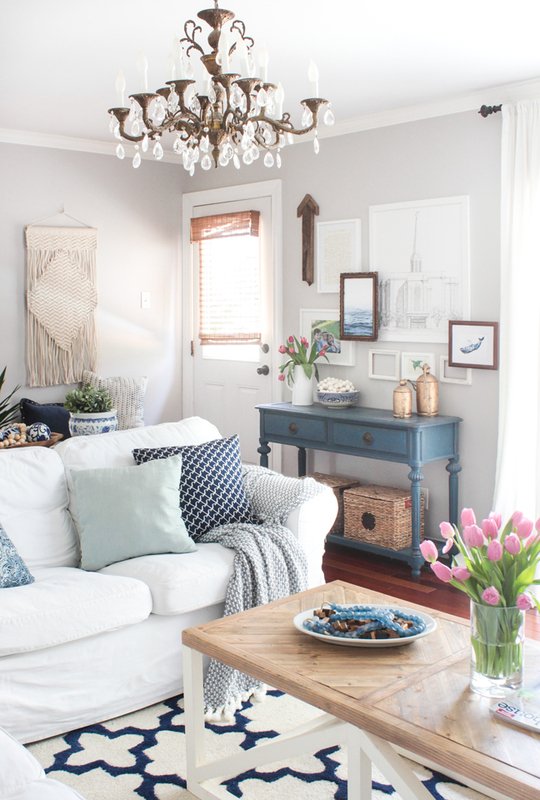 Your spring home tour is beautiful and you are so relatable. Your authenticity is appreciated! Where is your chandelier from and is it still available ? 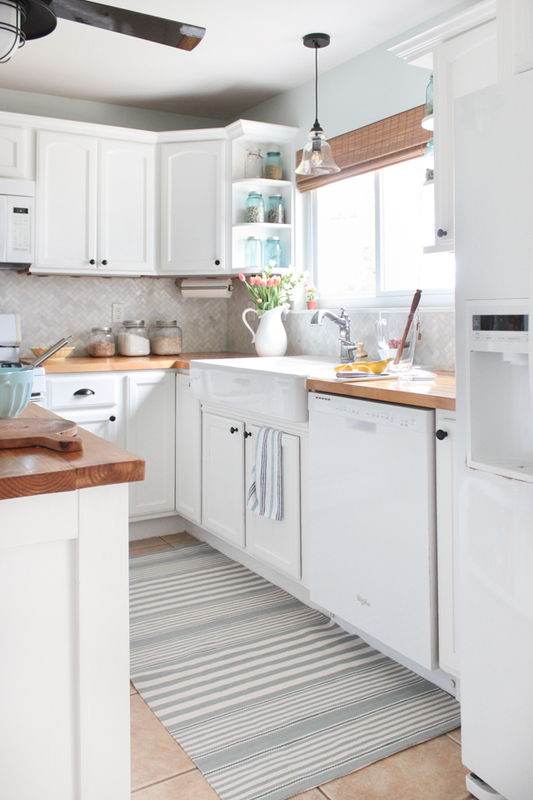 Where did you get the white cabinets on each side of your pallet wall? I am wondering about the size of your family room that is off the back of your kitchen. We are looking to add on and I like the set up of your space. I really like what you have done with your kitchen space as well. Also, I see what looks like a set of stairs in your kitchen. Do those lead down? We currently live in a split level, but I am looking for different ideas to move the stairs so we can add a full front porch to the front of the house. Thank you for any information you can offer. I love your decorating! 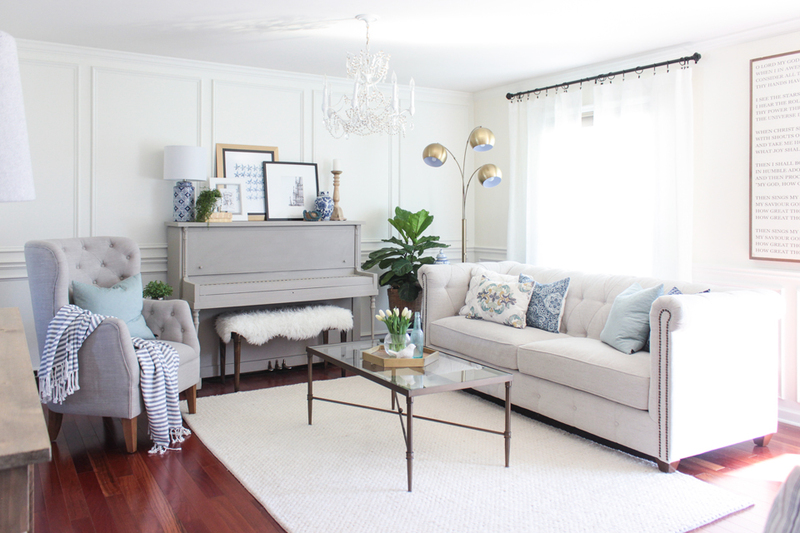 Your living room is my inspiration as I begin the process of re-doing my own. 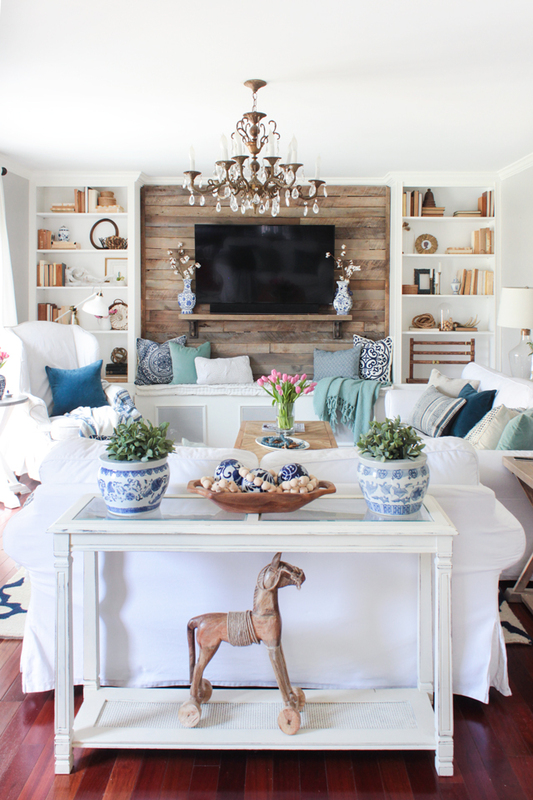 Please tell me, where did you get the coffee table picture in the “pallet-wall” living room? I love it! It appears to be the perfect size and shape for what I was imagining. Thank you for sharing your home with us!